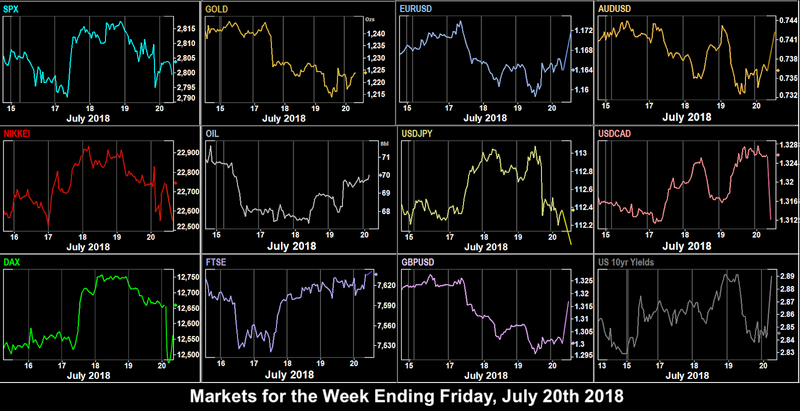 After falling in early trade, markets advanced to post modest gains for the day as trade war tensions were balanced by an early rise in the price of Oil (lost in late trade) on Iran tension, and a fairly positive outcome from the G20 summit in Argentina. Only NKY was down, reflecting the early strength of JPY and the time the market is open. USD generally had a good day with DXY advancing 0.25%, with all currencies and Gold giving ground. US 10-year bonds yields were particularly strong, up 7bp to a five-week high. GOOGL reported after the bell (a day earlier than we advised last week) and beat estimates, putting on 5% after hours to a new ATH. Buoyed by the GOOGL beat, a Chinese tax cuts and spending plan, rallying metals (not Gold) and Oil prices, equities continued to advance, shrugging off misses on the Housing Prices (13:00) and PMIs (13:45) prints. All Indices were up again. 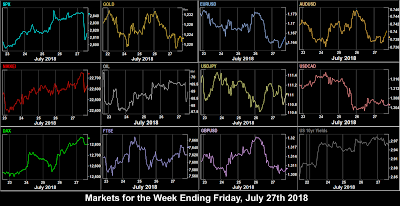 DXY was more or less flat on the day as a decline in EUR, its largest component, after mixed European PMIs at 08:00 was balanced by gains in all the other major currencies, where the Turnaround Tuesday effect was seen. Yields followed this and gave up some of Monday’s gain. Oil also turned, and put on 0.8%. Gold showed some volatility but ended up flat on the day. A definite day of two halves today in equities. US auto giants GM and FCAU both cut their forward earnings forecasts because of steel and aluminum tariffs. 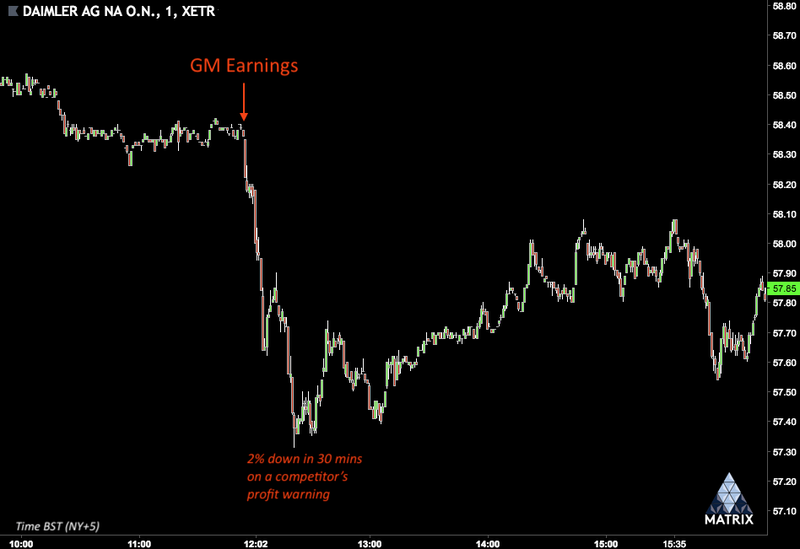 GM dropped 8.16% (4.6% at the close), and FCAU, who also missed on Q2 earnings fell 15.66% (11.83% at the close). Autos do not really feature in US indices, DJIA has none, GM, the largest in SPX is only 0.2% by weight, and TSLA is only 0.6% of NDX, so the US index effect was minimal. However, as we have mentioned before, the four German auto giants DAI, BMW, VOW and CON make up about 20% of DAX. The knock-on effect (sector sentiment) meant DAX was down 1.26% by the European close, despite the beat on all three Business Sentiment indicators at 08:00. However, reports of the meeting between President Trump and European Commission President Juncker, released after the European close were much more positive than expected, saying they would “work toward” zero tariffs, ie free trade. Critically, after the meeting Trump said he would not raise tariffs on European cars. Markets swiftly recovered, with SPX reaching a new near five-month high. DAX and NKY futures performed similarly. Only FTSE stayed down, as Britain will of course not benefit from any EU-US trade deal after Brexit. Foreign currencies (and Gold) also rallied on the Juncker news, taking 0.4% off DXY. The effect was particularly strong on CAD as traders interpreted the softening to the EU as positive for NAFTA. The loonie was also helped by a 1.7% (sustained) spike up in Oil after the strong (-6.15M vs -2.33M, lower is better) beat on EIA inventory. Yields were up 2bp in line with the risk-on sentiment. The Asian and European markets opened up on the EU trade talk success. FTSE was surprisingly weak given a further advance in Oil on news of a temporary Saudi shipment suspension, and a sharp fall in GBP. However, despite a $25Bn buyback announcement, oil giant Shell (the largest FTSE component weighing 10.35% across the RDSA.L and RDSB.L shares) fell 3.6% on its earnings miss, leaving the London index virtually flat on the day. 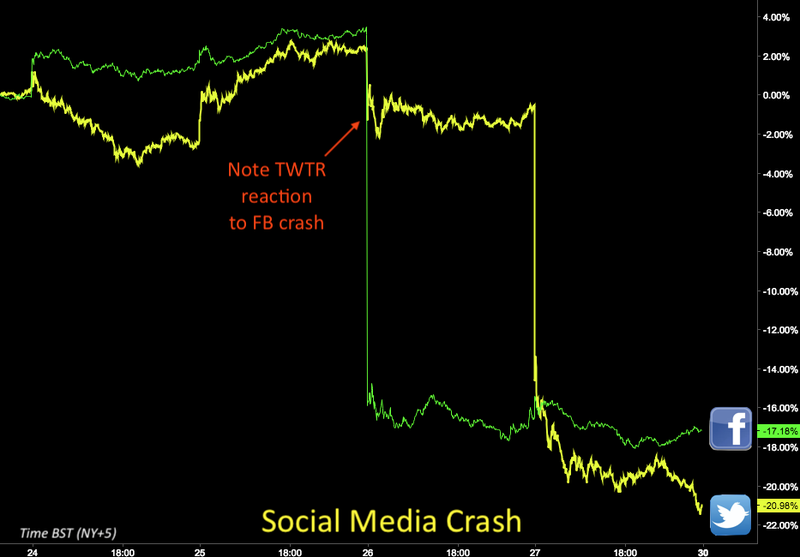 TWTR reported before the bell, and it was a similar story to Facebook. EPS and Revenue were fine, but a drop in users caused the stock to sink over 20%. To complete the FANG earnings season, AMZN reported at the end of the day, and doubled the estimate ($5.07 EPS vs $2.50 est). Shares rose a moderate 3%. 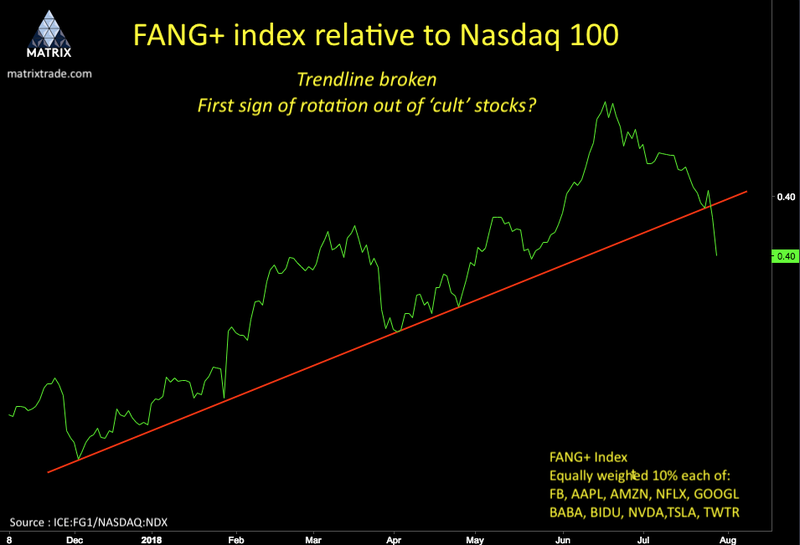 A clear pattern is now emerging with these FANG stocks. If every metric is positive, there is a moderate gain. If any metric (not just EPS and Revenue) disappoints, the stock falls heavily. Note that TWTR and FB results had a strong effect on the FANG+ index (ICE:NYFANG), which broke through an upward trendline for the first time since the index was created in late 2017. On the positive trade news, and anticipation of the GDP figure on Friday, talked up by Larry Kudlow, Trump’s economic advisor. the dollar had its best day of the week, with DXY putting on 0.66%. A lacklustre ECB press conference did not really move EUR, as it simply fell in line with all the other currencies and Gold. Yields were up 3bp in line with the stronger dollar. Friday’s GDP print had been widely anticipated, but in the end came in at 12:30 as estimated at 4.1%, and the PCE (inflation proxy) figure missed. 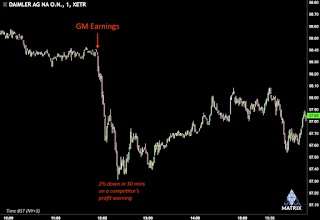 A clear case of buy the rumor sell the news, and that’s what the market did. The DAX had already been selling off in the European morning and accelerated in the US session (although once again, FTSE was out of sync, and only sold off after Europe closed.) Also NKY only started selling after the print. Both XOM and CVX missed estimates. XOM duly fell, but CVX rallied as the report included a $3 billion buyback. The dollar had rallied earlier, but gave up ground after the release, in line with indices. Most currencies were up, although Gold and GBP were flat. Oil was also down after advancing all week. Yields were down 1bp in line with the weaker dollar. 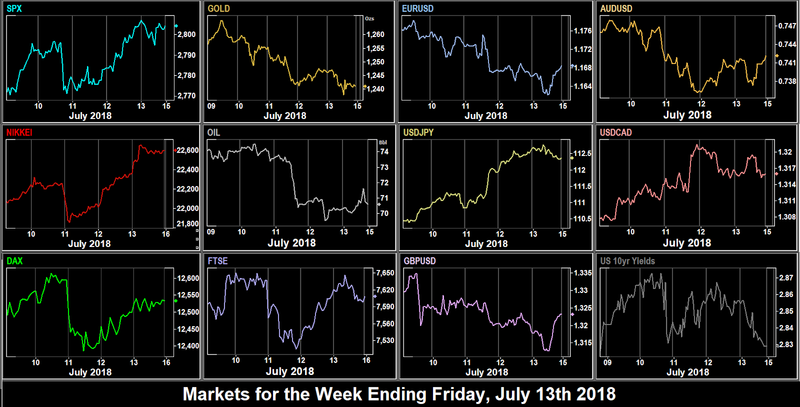 A second quiet week overall for currencies, with a slight USD upward bias (DXY added 0.25%). Without any more Brexit news, GBPUSD had an inside week. Note whilst all percentages are negative, this means CAD and JPY were up. Selling EURCAD would have netted you 1.18%. Indices had performed well until the sell-off on Friday. NIFTY did not sell off, posting a marubozu weekly candle, and its best week since January 2017. This was the best index trade. BTC continued to recover strongly, and for the second week well outperformed ETH. ETHBTC has fallen over 20% in the last two weeks. A packed week offers three major rate decisions as well as NFP, and a larger than usual number of economic releases. With a light schedule, attention will probably turn again to the trade war. The only news of note is the bi-monthly German inflation figure, which is expected to remain the same as two weeks ago. Although we are in the peak of earnings season, there are no significant (to indices) releases today. Look out also for any hints from China of retaliatory tariffs and/or internal policy stimulus. The first rate decision of the week comes at 02:00. Although a rate hold is virtually a certainty, traders will be looking to see if any change in policy is announced, given the recent sharp upturn in JGB 10-year yields which hit an 18-month high last week. The Eurozone GDP, inflation and unemployment figures are, unusually, released concurrently. Normally these do not move EUR much, but all three in the same direction might. In the US, the final comments for the second tranche of tariffs on $16bn of Chinese imports are due. Trump may well say something about how he wishes to USTR to act. High-flyer SHOP reports before the bell, but the central event of the entire earnings calendar, AAPL, the largest company in the world, reports after the close, usually a good 30 minutes after. They have only missed once in the last 22 quarters, and the EPS estimate at $2.18 is 51c lower than the Q1 actual. However, as we have seen recently, forward guidance and subsidiary metrics will also have to be good for the stock to rise. We may see the USTR decision on the $16Bn tariff package as early as today. Otherwise, after a raft of PMIs, the all-important Fed rate set meeting minutes are published at 18:00. A hold is priced by CME Fedwatch at 97.5% likelihood. Commentators will be looking for signs of dovishness, even as far as lowering the dot plot from two to one additional hike this year, given the subdued inflation levels, the tariff effect on the economy, and of course the recent comments from Trump about the hikes and the dollar. If this does happen, USD will start to fall again, but history tells us this will not be instant. Today is the peak of earnings season with 402 companies reporting. Of interest are loss making TSLA, already down 20% from its June high, and extremely vulnerable on the downside should anything negative transpire, given the very recent change in tech stock sentiment. X is another interesting stock. Theoretically a beneficiary of tariffs, it will be interesting to see if their guidance reflects that. Attention moves to the UK on Thursday, where a delayed rate hike is finally expected, the first to rise above the 0.50% set ten years ago. Or is it? GBP is about where it was on Jul 18, the day of the inflation miss, and Brexit concerns have not gone away. Watch also for the votes, which often have as much effect as the rate. Other data today is light, although in Japan we have BoJ Deputy Governor Amamiya speaking at 01:30, and at the other end of the day, the BoJ MPC Minutes, although these are unlikely have much effect, given the rate decision presser two days earlier. The pace of data continues unabated on Friday, (mostly PMIs again) but the main print is of course NFP, and the equally important AHE. The unemployment rate (est 3.9%, prev 4.0%) is now at what some economists call the ‘natural rate’, and comfortably inside the Fed’s own target. The statistic therefore becomes less important. On the other hand, the AHE must continue to outpace inflation, for the public to be able to afford rate hikes. In fact, it is arguable that AHE may have more effect than the jobs figure. The US trade balance figure is also published at the same time, of greater interest given the tariff wars. Note there is so simultaneous Canadian print this month. The week opened with little market movement from the Trump-Putin meeting, but a strong effect from 3.79% plunge in the price of Oil. (BNO was down 4.6%), on concerns about Libya production resumption, and OPEC output increases generally. Most markets were down, particularly FTSE (down 0.8%), which is an oil proxy, but oil-free DAX was slightly up. SPX was helped by gains in XLF (after the BAC beat on earnings) balancing a 1.2% fade in XLE, leaving the primary index only 0.1% down. The big event was NFLX earnings. This over-extended stock actually beat on EPS, but underwhelming subscriber growth precipitated a 13% drop after hours. Other NDX heavyweights dropped in sympathy, as QQQ trades hit stops. It was a quiet day for USD, with hint of downside across the board. DXY down 0.19%. Gold was flat in line. Surprisingly US Treasury 10-year bond yields were 3bp up, and the yield curve (US10Y-US02Y) widened by 1bp. NZD shrugged off the CPI miss at 22:45. Jay Powell’s optimistic Humphrey-Hawkins testimony at 14:00 delivered a Turnaround Tuesday in both equities and USD. All indices rallied strongly, with NDX, which opened 0.9% lower, but closed 0.63% high posting a prominent bullish engulfing candle. GS and JNJ both beat, but only the latter advanced. The risk-on indicators (Gold -1.04% and JPY -0.53%) fell noticeably, as did all other currencies. GBP fell particularly hard on further Brexit worries, as the UK ruling Conservative party continues to squabble internally. Average earnings, the first of the three UK prints this week came in as estimated. 10-year yields were up 1bp, but the two year note advanced 2bp, cancelling Monday’s curve widening. Notably the 3-month note rose 4bp to 2.02% on Powell’s remarks, the highest yield in a decade. Oil slid slightly ahead of the API stock miss. With the second day of upbeat Powell testimony, It was a flatter, but still positive day for USD, with Europe weakened by the CPI misses in the UK (08:30) and Eurozone (09:00). 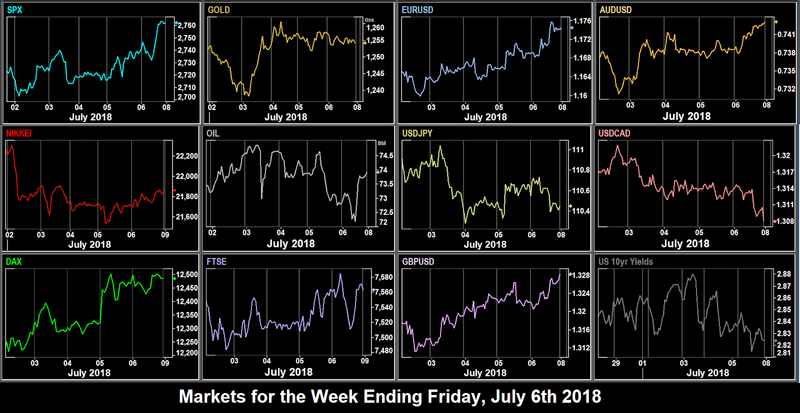 All currencies (and Gold) dipped down against the greenback in the Asian and European sessions, but AUD, JPY and CAD climbed back later to post modest gains, the latter helped by Oil reversing back up by over a dollar, despite the EIA miss at 14:30. The net effect was a flat (up 0.06%) DXY, although USDJPY did break 113 intraday, a six-month high. 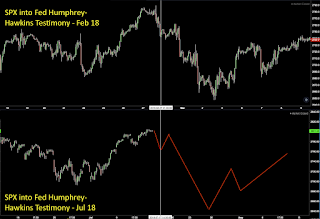 Equities showed a similar pattern, flatter but still up, except NKY which dipped slightly. 10-year yields were up 2bp widening the curve as the 2-year bond remained flat. AA earnings beat, but the stock fell as 2018 guidance was downgraded because of tariffs. AA operates three smelters in Canada, which will be subject to tariffs. Equities fell today on trade war concerns again. The exception was FTSE which managed a modest gain, buoyed by a weak GBP which hit a 10-month low, after the Retail Sales miss at 08:30 added to Wednesday’s CPI miss. Chinese stocks also fell and CNY fell to a 12-month low against USD. 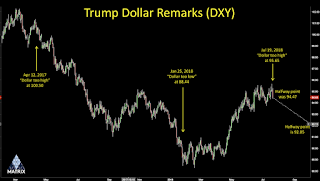 USD had been doing well until President Trump said he was “not thrilled” by the Federal Reserve’s interest rate hiking policy and said a strong dollar “puts us at a disadvantage”. The comment, at 17:00, immediately knocked 0.54% off DXY, and 0.71% off USDJPY. Some recovery, coupled with GBP (which hit a new 2018 low) and an equally weak CAD left DXY flat for the day. AUD (not part of DXY) was down 0.57%, despite a stellar jobs beat (51k vs 17k estimate). Gold was down $3 after earlier touching $1211.45 a 12-month low. WTI Oil was slightly up, but Brent fell, and the spread between the two fell sharply by over $1. Yields fell 3bp in line with the weaker dollar. 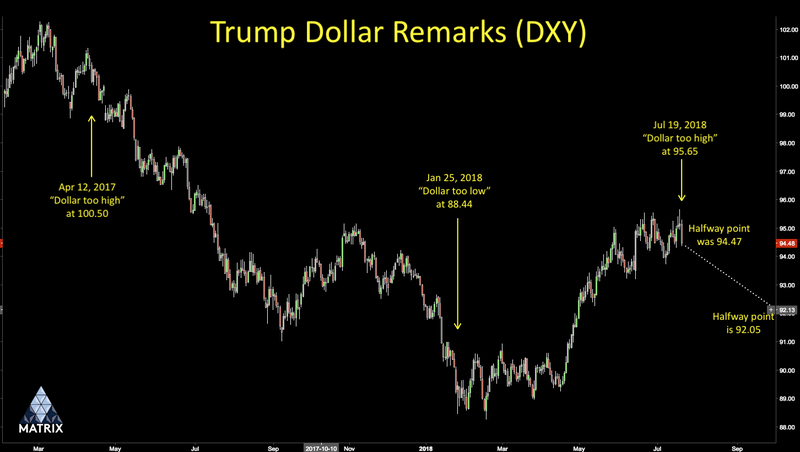 Further remarks by Trump about tariffs on Chinese goods, plus his remarks about the dollar continued to upset markets. All indices were down, particularly DAX which fell over 1%. NDX however manage to end the day flat, after MSFT beat earnings after Thursday’s bell and put on 3.34%, although some of this faded during the day. Some of the movement today can be attributed to option expiry. There was minimal movement in many currencies this week, especially AUD and CAD. Both NZD and JPY recovered, but GBP was hit by continuing Brexit turmoil. The best trade would have been to short GBPJPY. Indices were even flatter, with the tiny 0.16% drop in NKY being the strongest mover, belying a 400 point intra-week swing. Cryptos recovered, with BTC noticeably outperforming ETC. Another G20 meeting in Buenos Aires for finance ministers and central bankers this weekend. TreasSec Mnuchin is there. Trade wars are likely to dominate. Today is fairly quiet. BoE Broadbent (centrist, voter) speaks at 17:00. Singapore inflation is released and Egyptian markets are closed. AABA, which is Yahoo Japan plus the BABA holding reports after the bell. The day opens with German and Eurozone Markit PMIs, with all three prints (Manufacturing, Services, Composite) released simultaneously for each region. There is a public hearing on $16Bn of proposed tariffs on China, for consideration by the USTR. The UK Parliament goes into recess until Sep 4. There is a rate decision in Turkey. The first of three FANG earnings reports this week, GOOGL, comes after the US closing bell. Some political news on Wednesday; Trump campaign manager Paul Manafort’s trial opens in the US, and SecState Pompeo testifies to the Senate Foreign Relations Committee. As well as North Korea, he will be asked questions about the Trump-Putin summit. EC President Juncker is scheduled to meet President Trump for trade talks. The German IFO business sentiment indicators (Current Assessment, Business Climate, Expectations) have similar estimates to last month’s prints. It remains to be seen if they miss, like the investor sentiment figures on July 10 did. FB reports earnings today after the bell, as do KO, BA (before the bell) and V (after the bell). BA, KO and V make up 14.62% of DJIA, with BA 9.61% on its own. Today’s ECB rate set meeting would normally be the big event of the week, but little is expected (ie continuity) at this summer meeting. As always any fireworks will be at the press conference, not the actual rate release. If anything, a tendency toward dovishness is expected. The third FANG earnings report in as many days is AMZN, who report after the bell along with INTC. These two comprise 13.57% of NDX. Also reporting before the bell today is MCD, which is 4.26% of DJIA. The lead story today is the Q2 US advance GDP release, with an estimate of more than double the last one, along with PCE (inflation proxy) figures. Bullard (dove, non-voter) makes the only Fed speech this week. Before the opening bell we have earnings from TWTR (surprisingly not in NDX), and also oil giants XOM and CVX, which together make up 5.51% of DJIA. The most volatility was in GBP, which rallied 0.5% on the soft Brexit agreement news, but then gave up over 1.2% on the news that the ‘British Trump’ Boris Johnson (gaffe-prone, isolationist) had resigned from the UK cabinet. As the earlier resignation that day of Brexit Minister Davis had little effect on cable, one can only assume that traders worried about a party leadership bid (and therefore Prime Minister bid) by Johnson. This was also the first time two UK cabinet ministers had resigned on the same day for 36 years. Sterling closed 0.46% down, with a long lower tailed candle. Oil was marginally up (0.3%, which is nothing for Oil) on the day, although notably the BNO/WTI ratio hit a 12-month low. US Treasury 10-Year Bond yields were up 3.5bp tracking the stronger USDJPY. After the overnight Chinese inflation beat at 01:30, equities were up again on Tuesday although the effect was less marked in SPX and NKY, and FTSE was flat. DAX was the strongest performer today, helped by EUR weakness, and despite a big miss at 09:00 in the German sentiment reports we highlighted last week. SPX fell heavily after the cash close, to close red for ES futures. DXY had a similar day to Monday (up 0.11%) but the composition was different. AUD, GBP, NZD, Gold and yields all had Turnaround Tuesdays and reversed the previous day’s action, whereas EUR, CAD and JPY continued to fade. Oil again made marginal gains. In short, a dull day. As the US confirmed their further $200Bn of tariffs on Chinese imports, the dam broke with equities, and all moved sharply south. 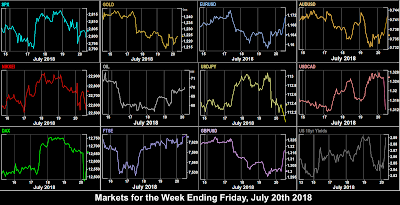 The rout started immediately after the Tuesday US markets closed, with NKY shedding 500 points in the Asian session (and ES futures down 1.12%). 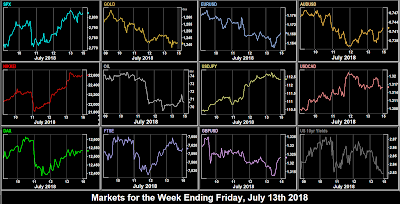 There was some recovery during the day, but European indices with their earlier close still ended more than 1% down. Normally, a risk-off move in equities triggers yen (safe haven) and Gold appreciation but not this time. JPY shed 0.92%, its worst day since March. Other currencies and Gold were similarly down, and DXY was up 0.55%. Although CAD spiked up briefly by 0.57% after the rate hike at 14:00, it quickly erased that gain. The most notable effect of the trade war was in WTI Oil, which faded 5%, its worst day in two years, (Brent fell 6.9%) and this is without any OPEC or Trump news, and notably, in spite of the EIA beat at 14:30 (-12.63M vs -4.49M), the strongest in two years. Despite the dollar strength, yields were down 3bp as money flowed from stocks to bonds. Thursday’s US equity markets saw all the previous day’s losses erased and more. The trend started in Asia, where YM_F (DJIA futures) was up 100 before Europe even opened. SPX hit a 5-month high, and NDX briefly made a new all-time high. NKY similarly made a new high for the month. However, the European indices could only recover in part from the day before. Metals, including Gold also recovered, although Oil did not, sliding further down (although BNO was up, widening the spread). The forex market was more subdued than usual, with main pairs EURUSD and GBPUSD virtually flat, as were yields. There was little reaction to the ECB Minutes at 11:30, or the Core US CPI print (2.3% as estimated) at 12:30. Overall, the trend was to dollar weakness (against the general trend for the week of dollar strength), with AUD, CAD and Gold up. Only JPY was down, continuing its unlinked pattern. Oil’s fade on 0.33% seemed flat compared to Wednesday. TRY hit a new all-time low. The equity rally started to falter. Although DAX and NKY posted gains they were more modest than the day before. FTSE was flat like Tuesday, and SPX faded in early, only to fall at the end and fining flat. Earnings season kicked off today in earnest, with bank heavyweights JPM, C and WFC reporting. Although the first two beat estimates, the market was unimpressed and all three lost ground, to leave XLF flat, and SPX only 0.2% up—which was still another five-month high. The Michigan Sentiment Index at 14:00 missed, as we predicted last week, although it had no appreciable effect. Forex much the same as the day before, generally, although the GBP and EUR candles had a long lower tails again as it dipped in early trade after Trump, visiting the UK said that the recently agreed ‘soft Brexit’ plan would hamper a US trade deal, and even that ‘Boris Johnson would make a great Prime Minister’. He later seemed to retract some of these remarks, calling reports ‘fake news’. JPY had a slight recover after four down days. Gold, which has done its own thing for most of this year, counterintuitively fell. Oil at last turned up a little, and yields were down 2bp in line with the dollar. After last week’s dip, USD recovered across the board. JPY had its worst week since September 2017, and buying USDJPY was the best forex trade. It is therefore no surprise that NKY was the best index performer, and as in often the case, Oil was the most volatile of all. Cryptos gave up last weeks gains, to sit roughly where they were two weeks ago. Over the weekend, we saw Trump change his position on the UK trade deal, withdrawing his criticisms of Friday. There was some action from Special Prosecutor Mueller late on Friday, charging Russian intelligence officers with hacking the Clinton campaign in 2016, potentially handing the election to Trump. Today President Trump meets Russian President Putin in Helsinki. Trump will undoubtedly speak to the press, and traders will be watching for a softening position on sanctions, and any comments about oil production. This would affect Oil and RUB. US Retail Sales (an inflation proxy) is the important print of the day. Earnings season continues with another bank BAC before the open, but more importantly, NDX star NFLX (2.15% of the index) after the bell. NFLX EPS estimates are usually very accurate. In the UK, BoE Carney and Deputy Gov Cunliffe speak at 08:00 to Parliament about the Financial Stability Report, followed shortly by the nearest thing the UK has to NFP. New jobs are not actually reported, but all the other stats are there, including the important Average Hourly Earnings. The disinflationary version of this (AHE-CPI) is used by central banks to determine whether the public can afford rate hikes on their mortgages. At 14:00, we have first day of Fed Chair Powell’s semi-annual Monetary Policy Report to Congress, known as the Humphrey-Hawkins testimony, after the senators who introduced the bill that mandates the report. 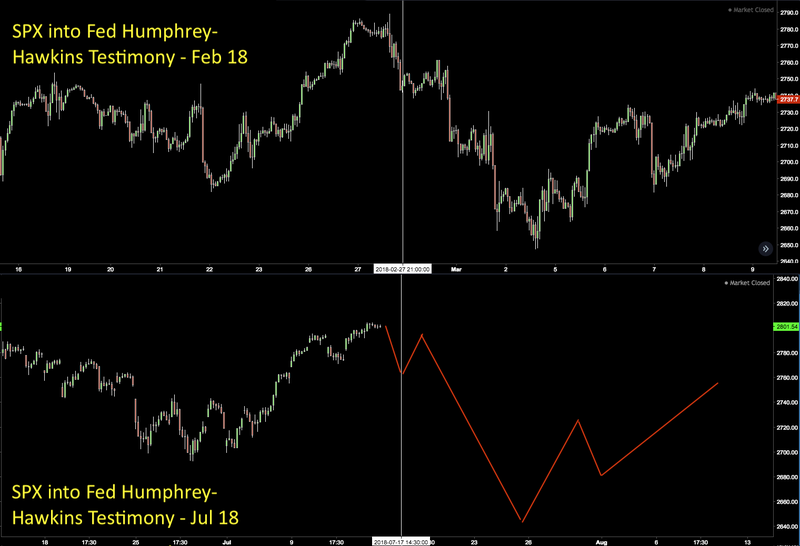 SPX price action looks very similar to the run-in to the previous report in February. GS and JNJ (together making 9.55% of DJIA, ie 24 points per 1% move) report before the bell. Attention moves to Europe with the British inflation figure following hot on the heels of the jobs report. These are the figures which will determine the UK rate decision on Aug 2. Given the BoE vote shift in June (where a third of members voted for a hike), we can safely say that beats on both jobs and CPI will have a markedly positive effect on sterling. The second day of Humphrey-Hawkins is usually less dramatic. More DJIA component reporting after the bell, with IBM and AXP (total 6.67% of the index). Also reporting is former Dow component AA, where it will be interesting to see if there has been any benefit to them from the recent aluminum tariffs. The Australian jobs report estimate is 40% higher than last month, and a beat may provide a boost for beleaguered AUD, which bounced off a 17-month low last week. The estimate of 17k is equivalent to 229k in the US which has 13.5x the population. The UK Retail Sales figure will add to the rate decision picture, although less so as it is only a proxy for CPI, released the day before. Fed Quarles (centrist, voter) speaks at 13:00. NDX giant MSFT (9.6% of the index, second only to AAPL and AMZN) reports after the bell. The week ends with OpEx day, the expiry of monthly options, which can cause of course heighten volatility. Fed Bullard (dove, non-voter) speaks at 12:00, and GE reports before the bell, the first earnings release since they left the DJIA after a 111-year run. The Canadian CPI estimate is slightly ahead of last month, but still below the May figure, as Canada still struggles to get traction in this area. As a rate hike already happened last week, it is difficult to foresee any CAD upside on this print. After tariff-driven weakness in the Asian session, which left NKY and European markets down, a recovery in the US session allowed SPX to finish 0.3% up. Some of this was timing. NKY closes first and lost the most, and Europe’s closing bell is four and a half hours earlier than New York. DAX edged into positive territory by the US close. The dollar had a good day against all the major currencies with DXY up 0.26%, and Gold was down in line. US 10-year yields fell after the ISM Prices Paid miss at 14:00, but recovered in line with SPX to end 2bp up on the day. Oil was up on the day. It was Turnaround Tuesday in the pre-holiday shortened day for pretty much everything except NKY which continued to fall. SPX and DAX were down, but FTSE was up, and USD was down across the board, with Gold up and yields down in line. The yield gap or curve (the difference between the two and ten year yields) hit a fresh 10-year low, below 30bp. Oil briefly topped the psychological $75 mark for the first time since 2014, before pulling back to end the day down. AUD rose after the rate hold at 04:30, but only to recover the previous day’s losses. With US markets closed for Independence Day, today was very quiet, with low volumes. Although US futures traded, all indices were flat on the day, with very little volatility. 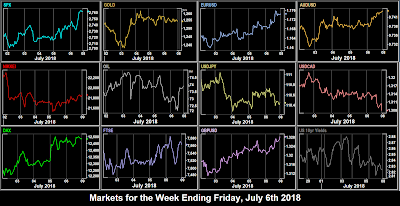 USD advanced very slightly against all currencies except GBP, which, as we indicated last week, benefited from the Markit Services PMI beat at 08:30, recording an eight month high, and resulting in a flat DXY. Oil and Gold advanced slightly. There was no bond trading. Markets often rally after a holiday, and today was no exception. Although NKY had fallen 250 points in the Asian session and only managed to close flat, SPX (up 0.61%), FTSE (up 0.53%) and DAX (up 1.17%) all advanced firmly into and through the FOMC Minutes at 18:00. 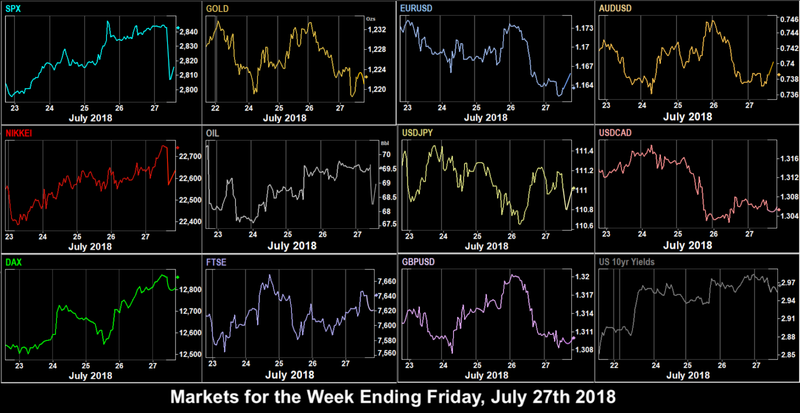 However, the sentiment was not reflected in the dollar, which was down across the board against other currencies and Gold, again with GBP being the exception. Oil was down sharply (1.6%) after the EIA Stock miss (+1.24M vs -3.54M est) at 15:00, one day late this week because of the holiday. Yields were flat on the day. Equity markets rallied into and out of the comfortable NFP beat (213k vs 195k est) at 12:30. The pattern was repeated in non-US indices. However the miss on AHE (2.7% vs 2.8%), which indicates a possible delay in rate hikes, meant USD was down across the board, DXY giving up 0.42%. All currencies gained ground, but surprisingly, Gold was slightly off. CAD was stronger after their NFP beat, despite a miss in Unemployment. after Oil recovered some of Thursdays losses. Yields were down in line with the weaker dollar. Last week was mixed, and this week was a clear dollar reversal, with DXY giving up 0.70%, its worst week since January. The strongest trade after two bad weeks was NZDUSD, up 0.90%. But overall, this was low volatility, also seen in indices, where DAX, FTSE and NIFTY had inside weeks (as did EURGBP). The the kiwi, DAX was the worst performer for two weeks, and this week was the strongest. The reversal also applies to cryptos, up slightly, but still only showing a fraction of their previous volatility. The UK cabinet agreed to a soft Brexit plan late on Friday. There is a speech by ECB Coeuré (hawkish, voter) at 20:30 Sunday. Monday opens with two appearances by ECB President Draghi, at 12:00 to the European Parliament and 19:00 giving the opening address to the ECB Statistics Conference. Other speakers are listed below. There is little economic news. 06:00 EUR Germany Trade Balance s.a.
Tuesday opens with a speech by BoJ Governor Kuroda at 00:30. The UK GDP print is a new statistic, a month-on-month estimate from the UK ONS. The normal QoQ figure is released on Jul 26th. The forward German ZEW confidence reports are likely to be balanced by relief over Italy, but concerns about the auto tariffs and CDU/CSU tensions. A two-day NATO summit starts today. President Trump is likely to reiterate his complaints about underpaying members. The big story of the day is the Canadian rate decision, and the staggered release of the MPC report and press conference. A 25bp hike is expected, but commentators are expecting dovish rhetoric surrounding it, due to the ongoing trade wars. The week ends quietly. The European Economic and Financial Affairs council (EcoFin) is discussing VAT and the terms of reference for the G20 Finance Ministers meeting on July 21st. This is unlikely to affect EUR or equities. Other than the CB speakers, the main event of the day is the Michigan sentiment index. The estimate of 98.2 is unchanged from last month, although some commentators are expecting a miss on this figure.